299 Marlborough is located on the north side of Marlborough, between Fairfield and Gloucester, with 297 Marlborough to the east and 301 Marlborough to the west. 299 Marlborough was designed and built ca. 1871 by Frederick B. Pope for speculative sale, one of eight contiguous houses (285-287-289-291-293-295-297-299 Marlborough) built at about the same time. 285-287-289 Marlborough appear to have been built first, in early 1871, with 287-289 Marlborough designed as a symmetrical pair. 291-293-295-297-299 Marlborough were begun later in 1871, designed as a symmetrical composition, with 291 and 299 Marlborough on wider lots with bays, and 293-295-297 Marlborough on less wide lots with oriel windows. 295 Marlborough, on the smallest lot (17 feet wide) forms the center of that composition, with a defined mansard roof, large dormer, and centered entrance. 291-293-295-297-299 Marlborough were built on a 102 foot wide parcel that Frederick Pope assembled from three lots. The eastern 34 feet was the remainder of a 100 foot lot he had purchased on November 19, 1870, and on which he had built 285-287-289 Marlborough to the east. He purchased the center 24 foot lot and the western 44 foot lot on October 17, 1871, from the estate of Sidney Homer. The western 44 foot lot was half of an 88 foot wide parcel that Frederick Pope and paper manufacturer John Dixwell Thompson had agreed to purchase jointly, 64 feet from Sidney Homer’s estate and 24 feet from Franklin Evans. On June 9, 1871, they agreed to divide the parcel, with Frederick Pope subsequently purchasing the eastern half from the Homer estate and J. Dixwell Thompson purchasing the western half from the Homer estate and Franklin Evans (301-303 Marlborough subsequently would be built on this land). J. Dixwell Thompson and his wife, Sally Phillips (Blagden) Thompson, lived at 287 Marlborough. All of the land was part of one of several parcels originally purchased from the Boston Water Power Company on January 29, 1866, by a real estate investment trust formed by John Templeman Coolidge, Franklin Evans, and Charles Henry Parker. The trust had subdivided the property into lots, which it sold to investors and builders, who then frequently resold the lots to others. 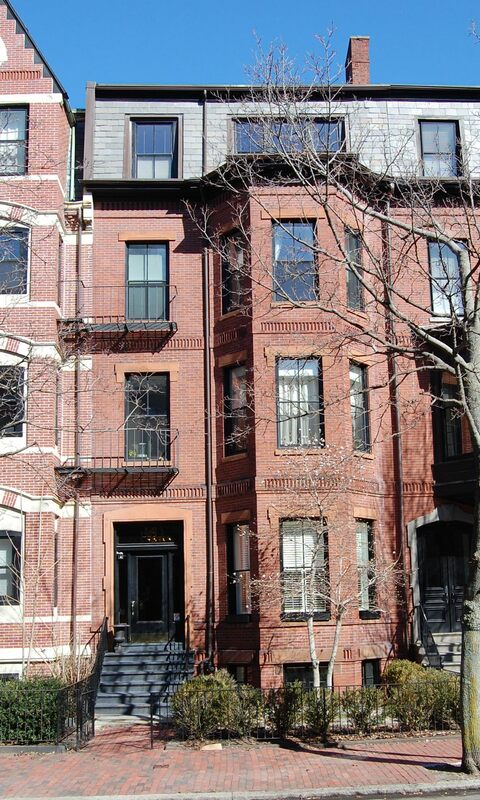 Click here for an index to the deeds for 299 Marlborough. On November 15, 1872, 299 Marlborough was purchased from Frederick Pope by Deborah Lazell (Nye) Cutler, the wife of Elisha Pomeroy Cutler. They previously had lived in Charlestown. Their unmarried children — Elisha Pomeroy Cutler, Jr., Dora Louisa Cutler, Eliza Frances Cutler, and Lucile Wheeler Cutler – lived with them. Elisha Cutler died in December of 1877. Deborah Cutler and their children continued to live there during the 1878-1879 winter season, but had moved by 1880. During the 1880-1881 winter season, they were living elsewhere. At about this time, Elisha P. Cutler, Jr., married to Alfreda M. Vining. He was a partner in his father’s business and also was treasurer of the Tremont Foundry at Culvert and Hampshire Streets in Boston. By the 1879-1880 winter season, 299 Marlborough was the home of Emeline (Dabney) Paterson Stackpole, the widow of Adam Paterson and of John Ward Gurley Stackpole, and her three adult children: Dr. Frederick Dabney Stackpole, Emeline D. Stackpole, and Roxanna Stackpole. Frederick Stackpole also maintained his medical office there. 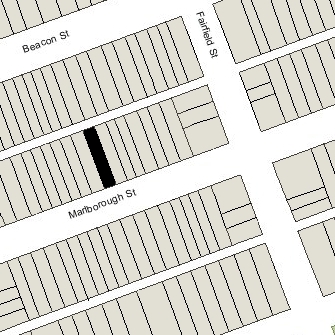 By the 1880-1881 season, they had moved to 282 Marlborough. Deborah Cutler resumed living at 299 Marlborough during the 1880-1881 season. Elisha and Alfreda Cutler, and probably also her daughters, lived with her. They moved soon thereafter to Hartford Street in Dorchester. She continued to own 299 Marlborough and lease it to others. During the 1881-1882 and 1882-1883 winter seasons, 299 Marlborough was the home of Lucien Carr, assistant curator of the Peabody Museum at Harvard, and his wife, Cornelia Louisa (Crow) Carr. They lived there while awaiting completion of the home they were having built at 346 Beacon. On August 5, 1884, Deborah Cutler transferred 299 Marlborough to her daughter, Dora Louisa Cutler. On August 13, 1884, 299 Marlborough was acquired from Dora Cutler by Mary W. Shattuck, probably Mary Williams Shattuck, the widow of Noah Gilman Shattuck of Groton. She previously had lived at 1 St. James, and moved to 2 Sherbrook Place in 1885. She appears to have operated 299 Marlborough as a lodging house. 299 Marlborough was not listed in the 1884 and 1885 Blue Books. On April 1, 1885, 299 Marlborough was acquired from Mary W. Shattuck by William Whitwell Greenough. He and his wife, Catherine Scollay (Curtis) Greenough, made it their home. They previously had lived at the Hotel Vendôme. They also maintained a home in Quincy. William Greenough was treasurer of the Boston Gas Light Company. He died in June of 1899 and Catherine Greenough died in September of 1899. 299 Marlborough was not listed in the 1900 Blue Book, nor does it appear to have been enumerated in the 1900 US Census. On October 29, 1899, 299 Marlborough was acquired from William Greenough’s estate by Elizabeth (Hunt) Jackson, the wife of banker and broker Isaac Jackson. They previously had lived at 51 Gloucester. They also maintained a home in Sherborn. Isaac Jackson’s father, Dr. Alexander Jackson, lived with them until his death in December of 1901. The Jacksons continued to live at 299 Marlborough during the 1913-1914 winter season, but then lived elsewhere for the next several seasons, possibly in Princeton, Massachusetts. Isaac Jackson continued to list 299 Marlborough as his residence in the City Directories (but not the Blue Books), and the family may have lived there for part of the year. By the 1914-1915 winter season, 299 Marlborough was the home of US diplomat Joseph Clark Grew and his wife, Alice de Vermandois (Perry) Grew. The Grews continued to live at 299 Marlborough during the 1916-1917 winter season. By April of 1917, he was chargé d’affairs of the US Embassy in Vienna when the Austro-Hungarian empire severed diplomatic relations with the US. He subsequently served in various foreign service and State Department posts, including as Under Secretary of State from 1924 to 1927, ambassador to Turkey from 1927 to 1932, ambassador to Japan from 1932 until the outbreak of World War II in 1941, and again as Under Secretary of State in 1944 and 1945. During the 1917-1918 and 1918-1919 winter seasons, 299 Marlborough was the home of textile manufacturer Robert Shurtleff Wallace and his wife, Florence (Lyman) Wallace. They had moved to 5 Exeter by 1920. By the 1919-1920 winter season, the Jacksons were living at 299 Marlborough once again. They continued to live there until Isaac Jackson’s death in August of 1930. On November 14, 1930, the Massachusetts Hospital Life Insurance Company foreclosed on its mortgage to Elizabeth Jackson and took possession of the property, and on November 14, 1930, it was acquired from the company by Anna L. Kamber, the wife of Albert Kamber, an insurance agent. That same month, Albert Kamber filed for (and subsequently received) permission to convert the property from a single-family dwelling into eight apartments. On April 30, 1931, Anna Kamber transferred 299 Marlborough back to the Massachusetts Hospital Life Insurance Company, and on May 1, 1931, it was acquired from the company by Louis Marcone. In June of 1931, Louis Marcone filed an amendment to the permit application filed by Albert Kamber, reducing the proposed number of units from eight to four. On August 20, 1931, Louis Marcone transferred the property back to the Massachusetts Hospital Life Insurance Company, and on November 3, 1931, it was acquired from the company by John A. McLeod. That same month, he filed an amendment to the permit application, increasing the proposed number of units back to eight. On April 4, 1932, Massachusetts Hospital Life foreclosed on its mortgage to John McLeod and took possession of the property. It appears that the remodeling of the property was not completed. The house was not listed in the 1931-1967 Blue Books nor in the 1931-1936 Lists of Residents, and either was not listed or was shown as vacant in the 1931-1936 City Directories. On August 19, 1936, 299 Marlborough was acquired from the Massachusetts Hospital Life Insurance Company by real estate dealer Overton W. Ogilvie. That same month, he filed for (and subsequently received) permission to convert the property from a single-family dwelling into five units. This remodeling was completed and there were residents listed at 299 Marlborough starting with the 1937 List of Residents and 1937 City Directory. On March 19, 1959, 299 Marlborough was acquired from Overton Ogilvie by Charles M. Rhodes, and on March 20, 1959, it was acquired from him by real estate dealer and future hotel owner Isaac M. Saunders and his sons, Roger A. Saunders and Donald L. Saunders. On December 17, 1962, 299 Marlborough was acquired from the Saunders family by Benjamin Ruiz and his wife, Helen Tucker Ruiz. They lived in one of the apartments. They previously had lived in an apartment at 391 Marlborough. On November 2, 1964, 299 Marlborough was acquired from the Ruizes by real estate dealer Edward L. Britt and his wife, Ann M. (Lynch) Britt. On September 1, 1966, 299 Marlborough was acquired from the Britts by Mary S. Kingsbery. She lived in one of the apartments. On June 1, 2005, 299 Marlborough was purchased from Mary Kingsbery by the 299 Riverside LLC (Jeffrey Feuerman, manager of record). 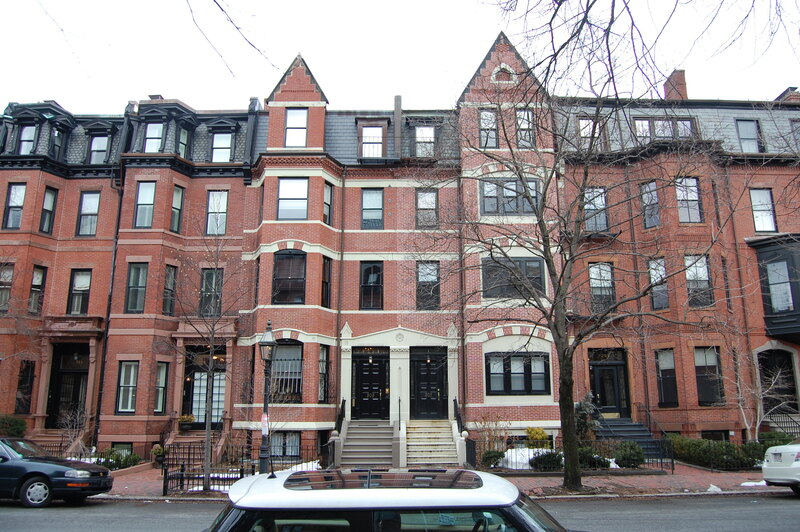 On February 13, 2006, it converted the property into five condominium units, the 299 Marlborough Street Condominium.